Ball Pythons (Python regius) are medium-sized constrictor snakes (total length of 24””-40” for males and 36”-60” for females), native to partly forested areas in central Africa. Ball Pythons are crepuscular (most active at dawn and dusk) and semi-arboreal (meaning they like to climb trees). This snake gets its name from the unique defensive behavior of rolling into a tight ball with their head hidden in the middle. They don’t require a lot of space and make a good choice for someone looking for their first snake as a pet. 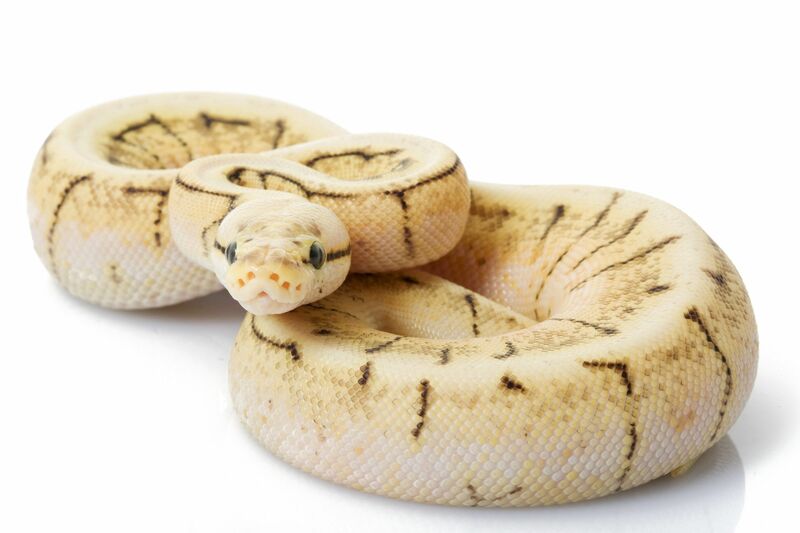 Selective breeding has produced many different color morphs of this species, and the available colors available have turned many Ball Python owners into die-hard collectors who end up with a several snakes. A well-kept Ball python can live for 20 to 35 years. Enclosure: The best home for a Ball python is a screen-topped glass aquarium with a very secure lid. Baby Ball pythons need a tank that measures at least 20”x10”x12”; an adult requires a tank of at least 30”x12”x18”. They need a warm environment decorated with reptile-safe bark, aspen shavings or reptile-carpet as a substrate. Cedar shavings should not be used as they are toxic to. A few hiding places made from rocks or pieces of tree bark should be included or the snake will become stressed. It is important to locate hiding spots in both the warmer and cooler sides of the enclosure to help the snake thermoregulate. A vertical branch or accessible rock ledge should be included for basking. Temperature: Ball pythons are temperate to tropical animals that need warm temperatures in the range of 80º-85ºF (27º-29ºC) during the day and 75º-80ºF (24º-27ºC) at night. These temperatures can be maintained using an under-tank heater or ceramic heat-emitter in combination with a basking spot lamp and/or a red nighttime spot lamp. Place the lamp on one side of the tank to create a “warm side” and a “cool side” in the environment. A thermometer should be included on each side of the tank to monitor temperatures. Heat-rocks are not recommended as Ball pythons can burn themselves on these devices. Humidity can be maintained by misting the enclosure lightly once a week. Lighting: Like all reptiles, Ball pythons benefit from fluorescent lighting with an emphasis on UVB wavelengths of light in order to make use of certain vitamins and minerals in their diet. Since they are crepuscular they can be given as little as 4 hours of fluorescent light per day however. A basking lamp is needed for 10-12 hours per day, with an appropriate basking spot located 12-18” beneath the lamp. Locate the basking lamp on one side of the tank to create a temperature gradient and to leave some of the enclosure dimly lit during the day. Place lighting on a screen top as opposed to glass or plastic, both of which block the beneficial UVB wavelengths of light. Screen tops also allow excess heat to escape the enclosure and allow for better air-circulation. Diet: Ball Pythons should be offered prey items once per week, although it is normal for younger ones to eat more frequently than adults. Offer only killed rodents (much safer than live rodents which may attack the snake) that are no wider than the widest point of the body of the snake. For very young Ball Pythons start with “fuzzy” mice that are about 5-10 days old. Offer progressively larger mice as the snake grows. Adults can eat “fuzzy” rats or even half-grown rats. Do not handle your snake for at least a day after feeding, as this can lead to regurgitation. Ball pythons are well-known for going on hunger strikes at certain times throughout the year, particularly in the winter months. Be prepared for the possibility of your snake going off feed, and keep an observant eye on the snake's overall condition and body weight. This is typically nothing to worry about with healthy, well established pythons. If your snake is healthy continue your husbandry routine as usual, yet reduce the amount of handling the snake receives to a minimum. Offer your ball python food every 10-14 days until interested in eating again, as the snake will eventually "turn back on" and resume feeding normally. Water should be provided in a shallow bowl that is still deep enough to cover the back of the snake and is large enough for the snake to curl up in. Be sure that the snake can easily climb in and out of the water bowl. Clean water is essential, and water bowls should be cleaned daily when fresh water is provided. Maintenance: Any waste product or spoiled food items should be removed as they appear. The inside surfaces of the enclosure and the decorations should be cleaned once weekly using a reptile-safe cleaning product like Wipe-out 2 or Wipe-out 3 by Zoo-Med. Be sure to remove traces of cleaner by wiping thoroughly after cleaning and allowing the enclosure to dry. Food and water bowls especially need to be kept clean and should be washed thoroughly when fresh food and water is given. Replacing the substrate every 2-4 weeks is recommended for good health and to reduce odor. Handling: Ball pythons are fairly easy snakes to handle, with some seeming to be completely unbothered by being picked up. It is unusual for a Ball python to bite once it has become acquainted with its handler, but do not allow children to handle snakes without supervision in order to keep the animal safe. It is important to wash your hands before handling a snake as trace odors from prey items or other snakes may encourage it to bite. Ball python bites can be painful and may leave small wounds. Snake bites should be disinfected immediately and wounds should be covered while handling the snake or anything from its enclosure. The best method for handling is to pick up the snake by the middle of the body and then immediately supporting the front with the other hand by holding it from underneath, just behind the head. Ball Pythons will often wrap themselves around your arm and rarely do they try to move away. Use slow movements when approaching to prevent a nervous reaction. Always remember to wash hands after handling any reptiles as there is a very slim threat of contracting Salmonella bacteria from them.